/ Modified may 4, 2018 12:30 p.m.
Human rights groups say while there is an uneasy relationship with Border Patrol, saving lives is what matters. 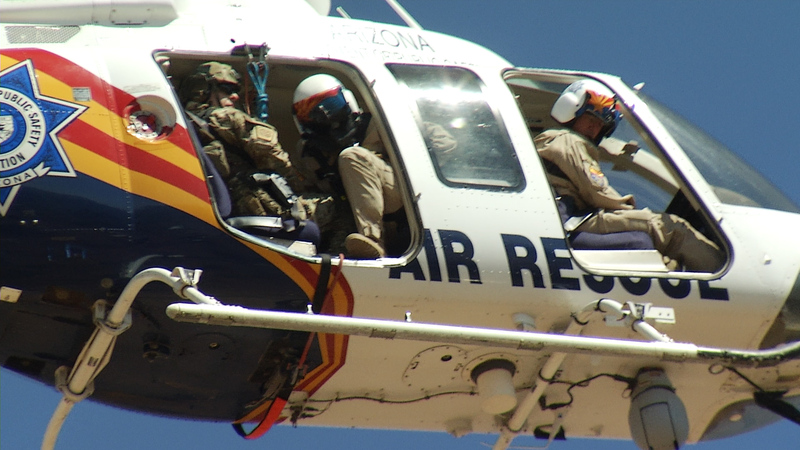 A joint, simulated rescue by Border Patrol and DPS, May 4, 2018. 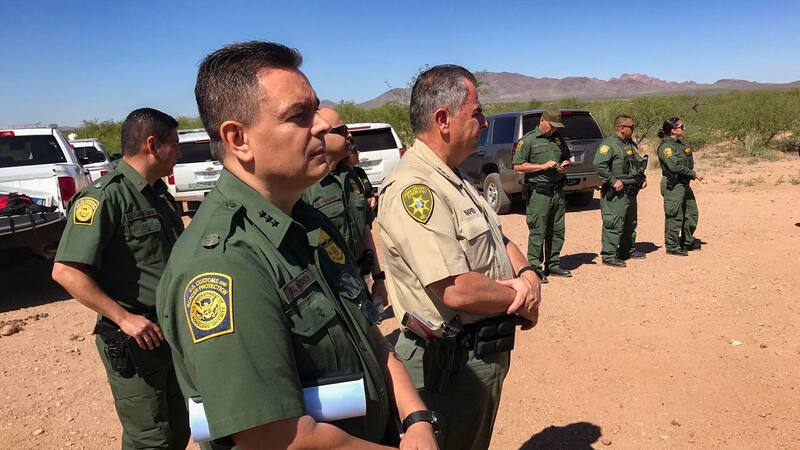 Impeding hot Arizona temperatures have triggered the Border Patrol Tucson Sector to launch its summertime Border Safety Initiative. It was Border Patrol’s chance to highlight their search-and-rescue apparatus. It all happened in the desert near Amato off of Arivaca Road on May 4. "When a migrant is lost in the desert, unprepared without the necessary means to obtain help — death can come very quickly," said Tucson Sector Chief Rodolfo "Rudy" Karisch. Karisch emphasized the Tucson Sector’s 34 solar-powered rescue beacons located in some of the most remote desert regions between Three Points and Yuma County. "Activating a rescue beacon initiates an immediate response from the Border Patrol and the nearest agent will be dispatched to render aid," said Karisch. 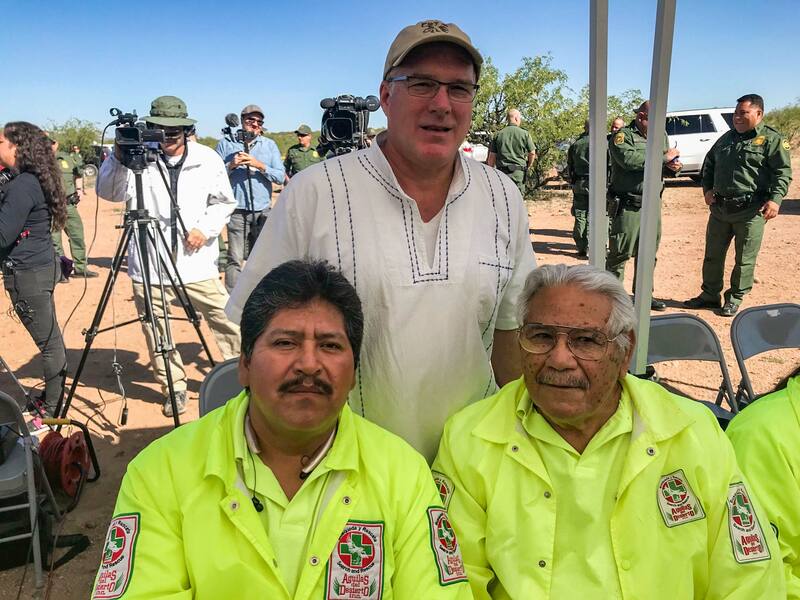 Tucson Sector Chief Rodolfo "Rudy" Karisch and Pima County Sheriff Mark Napier at a Border Safety Initiative event, May 4, 2018. And that’s a good thing, say members of the Green Valley and Sahuarita Samaritans, who were part of the group listening to the presentation. The Samaritans are known for setting out food and water and rendering medical help to lost migrants in the desert. "No doubt Border Patrol will rescue stranded migrants and save them from impending death, but they will also arrest and detain them," said Randy Meyer, the pastor of the Good Shepard Church of Christ in Sahuarita. Meyer, one of the founders of the area’s Samaritans, says Border Patrol has its role and the Samaritans have theirs. There have been tensions between human immigrant rights groups and the Border Patrol. "We feel it is our right as people of faith and people of conscience to be in the desert to be giving water and food and medical care to anybody we find," said Meyer. "There is nobody that can take that away, that is the right of every U.S. Citizen." VIEW LARGER Green Valley Samaritans cofounder Randy Meyer, middle, with members of a Mexican rescue team. It is an uneasy relationship between Border Patrol’s rescue but arrest mission and humanitarian groups and their rescue and without report mission. In the middle is Pima County Sheriff Mark Napier. Napier has been a strong opponent of Attorney General Jeff Session’s demand that local law enforcement get involved with immigration efforts. But Napier says joining Border Patrol in rescue missions is about saving lives, not making arrests. "You know, there are a lot of discussion, a lot of emotions and a lot of heated rhetoric around these issues. A lot of people say that I should not enjoy a strategic partnership with our Border Patrol partners. I would say that is absolutely false," Napier said. Napier says that, in the end, the Border Safety Initiative will save lives this summer.